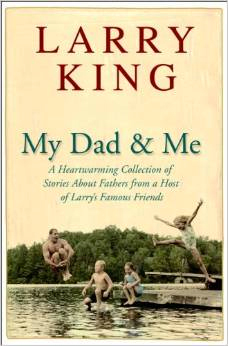 In 2006 internationally recognized talk show host Larry King personally selected 120 "celebrated and successful friends" to contribute their favorite memories and recollections about their fathers for his book, "Larry King: My Dad and Me a Heartwarming Collections of Stories About Fathers from a Host of Larry’s Famous Friends". Dr. Fisher was personally asked by Larry King to contribute to this inspirational collection of stories. Dr. Garth Fisher is a renowned plastic surgeon whose work appears on the popular television show Extreme Makeover. He was named one of the best cosmetic surgeons in his field in Best Doctors in America, and authoritative listing of the medical world. His expertise and excellence are sought by top celebrities and business people from all over the world. It was the last conversation I ever had with my father and was also the last time I would see him. I was eleven years old on that overcast September afternoon, when an incident in the basement of our home in Ithaca, New York, changed my life forever. My father, Donald Garth Fisher, a U.S. Air Force major who had been teaching at Cornell University, had just received his order for a highly classified reconnaissance mission in a faraway place called Vietnam. As he hugged me tightly late that afternoon, my father told me there was a chance he might not be able to return to my mother, my sister, and me. “You need to be the ‘man’ of the family while I’m away.” He told me that I would need to be strong and stay focused on caring for our family if that happened. In that short and critically powerful message, my father summed up the entire legacy he would leave to me. He was right about everything he said. He would never return, and my life would never be the same again. My mother, my sister and I moved to live with my maternal grandparents in Laurel, Mississippi, after my dad left. We all crowded into one bedroom, which became my “home” for eight long years. What I learned about that faraway place called Vietnam came mostly from television news programs. The news from Vietnam was not good. Something had gone terribly wrong with my father’s mission. He would ultimately be declared “missing in action”. My family was plagued by political confusion. Multiple sighting and reports indicated that my dad was a prisoner of war. The Department of Defense disagreed. Over the next decade and a half, I desperately hunted for clues about my father’s fate, and even tracked down the one surviving crew member from his destroyed aircraft, against the wishes of the Pentagon. Finally, the Department of Defense classified him as KIA, which I learned meant “killed in action”. The intervals of time were painful and excruciating. My grandfather was kind and generous to me. What he lacked in shrewdness and sophistication he made up for with integrity. My father had been a strict disciplinarian, but there was always an inner sense of compassion, a quiet, vibrant demeanor and deep sensitivity toward his family. It was this blend of what he represented and what I can remember that I ultimately began to appreciate. I missed his guidance desperately, and wanted to do the things he’d spoken of in his final conversation with me, which I thought about often. As I grew up, I learned that honor and integrity were principles that guided my dad. He wasn’t physically with me, but his spirit loomed large in my desire to conduct my life so that he would be proud of me. Financial assistance from the government was meager, and I took on many jobs to help support my family. Even as a young teenager, I tried to live by the mantra of my father’s message, which would guide me for the rest of my life. Newspaper delivery routes, washing dishes at a local restaurant, summer construction jobs, and even roofing were a few of my many jobs during junior college. I never ventured far from home during this time, as I thought my father would want me to be close to the family. It was while I attended a local junior college that I took a part-time night job as a janitor at the city hospital. There, on a chance occurrence, I accepted an invitation to observe a gallbladder operation. That single circumstance was the event that shaped my goals and aspirations. I knew my future was to be in medicine, and I wanted not only to be a surgeon, but the best possible surgeon I could be. My father would have expected no less of me. I was blessed during this journey to have been influenced by several surrogate fathers. Each in his own way contributed to the principles I developed. I was fortunate, as well, to have been trained by some of the finest surgeons, who imparted not only precise and masterful surgical techniques but also the art of treating patients with respect and compassion. Often I reflected how, despite my apparent disadvantages, I journeyed from the small town of Laurel, Mississippi, to the competitive marketplace of a successful Beverly Hills plastic surgery practice. Being selected as the initial surgeon to be featured on ABC’s Extreme Makeover show was an incredible honor for me. And now I’ve come full circle. I am scarcely older now than the age that my dad was when he left us on that cool day in September. I have a wonderfully supportive family and two precious children who form the center of my universe. As I watch my two girls grow and develop, I think every day about what their lives would be like if I was suddenly taken away from them. As a physician, I recognize the value of human life, and on other, far more personal level I am cognizant that in a very special and unique sense, every day with my family is a blessing and achievement of its own. In that wonderment, I can’t help but pause and know my father is with me today, perhaps not in the operating room, but in a larger sense guiding and directing my family as a proud parent, as surely I would have wanted him to do. His last message to me, almost forty years ago, still rings true to this day. In many ways, it is a message of hope that all parents might provide to their children.